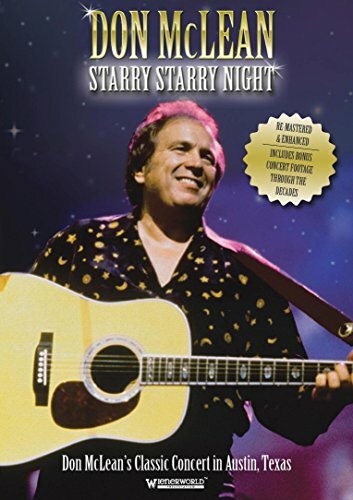 Travel back in time, well back to 1999 at least, with Don McLean’s Starry Starry Night DVD, a remastered and enhanced version of his Austin, Texas concert from the Paramount Theatre, which was filmed for PBS. While this new version is boosted with some quality bonus footage like even more concert footage from throughout the decades as well as some backstage footage from 1975, Starry Starry Night is what it is – a concert – so you should know what you’re getting into right from the start. Backed by an orchestra and joined by Nanci Griffith at times (“Raining In My Heart,” “And I Love You So”), McLean is a master of his trade throughout Starry Starry Night, delivering hit after memorable hit (“Vincent,” “Crying (Starry Starry Night),” “Castles In the Air,” “If We Try”), before ending the set in the fashion you’d expect – with his timeless classic “American Pie,” a song as woven into the fabric of Americana as, well, apple pie. There’s interview excepts mixed throughout the track list as well, which enhance things a bit, but McLean and these songs are the story and the obvious selling point. Starry Starry Night is a must have for McLean fans and a worthy viewing for casual fans as well.